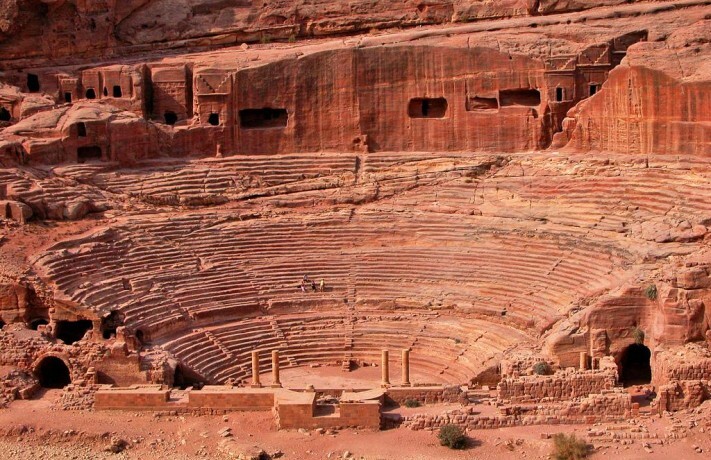 The theater as a multi-significant cultural phenomenon and interactive communication system, as artistic creation, social event and formative/educational good constitutes both the bearer and the content of civilisation, the trace and the indicator of the human course of development from the primitive era to the age of globalization. Therefore, in trying to perceive its complexity and daring to form a holistic idea about it, far from any national particularities, genre classifications and temporal reformations, we are compelled to a dual perception within its historic context; on the one hand as secular creation in time and place with its timely significance, as historical outcome of particular adaptation, as conceptual entity with specific content as well as a tangible formulation with heterogenic characteristics, thus demanding its multi-faceted presence in History and Civilization and finally in time; on the other hand it demands to be seen as a field of formation and signification of acts and actions, past relations and conditions, actual or imaginary, personal or collective, comprising developments of civilization, this way allowing our regression to History and its theatrical representation. Along these lines and with this dual perception as a starting point and a working hypothesis, the theater becomes a metonymy of History, and History becomes the condition sine qua non for the theater so that it becomes possible to recognize one in the other and vice versa. The basic presupposition for the adoption of such an interpretation is that the theater reflects reality in high fidelity, in itself constituting a “secondary signification system”. The outcome of this relationship between the theatrical and the real and vice versa, at times cryptic and beautified and at other times revealing and deconstructive, can only be complete and conceptualized through the process of its autonomous stage transfiguration. Understanding its reception as stage spectacle and tracing its perception mechanisms on the part of the viewers as its natural receivers are absolutely necessary. Consequently, the theater in time and civilization cannot merely be perceived as a narrative of the evolution of the various genres and forms of expression, nor can its original sources be substituted by performing formulations. On the contrary, the theatrical turns into a system of a multi-dimensional signification of the real, enriched with parameters and possibilities which bring together History with Theory and Communication, Sociology with Semiotics and Anthropology, the real with the subjective, the experiential with the imaginary, the past with the future, thus defining its character as a holistic cultural phenomenon. On account of all its timeless characteristics, the concept of “theater” is ascertained to exist in all forms of civilization and to express human creation from primitive times to the age of late modernity. Beyond the intention of composing a study which would deal with the development of the theater along with human history and expanding into the presentation or names and titles from its rich course in time, the present study has a more ambitious aim. This aim involves the perception of the concept of “theater” in its entirety and point out exemplary instances of that course and the ways those were expressed through its diversity and multiplicity. Such has been the transition from the primitive ritual to the contemporary drama, the transformation of the concept of the viewer/citizen of the Athenian city-state to the viewer/consumer of the modern globalised cosmopolis, the formation of the concept of “art” and “popular” theater, as well as the connection between the theatrical and the social, the illusionary and the real and the presence of theater and theatricality beyond the typical performance, on the stage of everyday life. Noting these parameters, which are in close correlation to History and Civilisation and cause a creative dialogue between art and technology, requires the complex recording of all theatrical signs as these have been traced in the course of time and all testimonials of the various elements in which the historical is attached to the theatrical and vice versa, thus making up the cultural conscience and memory of the contemporary viewer. These are exactly the challenges faced by the present study, at the same time inviting but also enticing all future readers. The study has developed in six chapters and a seventh concluding one. The first one, (“The sacred and the secular in the theater. The theater as ritual and artistic creation in Ancient Greece”) follows the course of the theater from its first conception and expression in primitive societies in the form of magical-religious ceremony and worshipping until the constitution of the theatrical place and time, the theatrical communication and its transformation into an artistic creation, through the religious and social character of the Ancient Drama. The third chapter entitled “Stage dynamics and ideological intervention. The theater as vehicle for change” is dedicated to the political and ideological dimension characterizing the theater, through which it is transformed into a power that can change the world. Here a detailed presentation of the theater of ideas and the proletarian theater are exposed, as well as the political theater and the documentary-theater as they are mainly present in the works of B. Brecht and other representatives of the genre, such as P. Weiss, R, Hochhouth, Dario Fo, Aug. Boal and others. The fourth chapter (“The popular and the artistic in the theater. The theater as entertainment”) approaches the timeless presence of the theater through two different types of expression, corresponding to the two different worlds they represent, that of the “popular” and that of the “artistic” creation. The causes and the ways of their development are analyzed, together with their similarities and differences and their timeless interaction and communication both on text level and performance codes, which promote its aesthetic and artistic value as cultural creation. The fifth chapter, entitled “From the dramatic text to the theatrical performance. The theater as memory record, the theatrical phenomenon is approached holistically, from its first moment of conception and creation as dramatic speech until its transformation into a stage act and finally the way it gets recorded into memory by the conscience or the subconscious of the viewer. The sixth chapter, “Teatrum Mundi. The theater as everyday practice there is a study of the the theater case as “performance”, observing the existence of theatricality in everyday life, in festivities and politics. The study is concluded with a seventh chapter, in the form of an epilogue, “Teatrum perennis. The theater as timely reality”, in an effort to draw conclusions and expand our thoughts into the future of the theater in the era of the globalized virtual reality of cyberspace. All primary and secondary modes of expression presented and analyzed complete the puzzle of the development of the theater in the course of time and History and detail its position in the human civilisation.